Trade Show Exhibit Rental: Generic Booth or Branded Booth? Trade Show Exhibit Rental: Get A Generic Booth or A Branded Booth? I was at a trade show a couple of weeks ago and was surprised at how many generic trade show booths were still rented by exhibitors. Don’t get me wrong, I think exhibit rental is a very good solution for exhibitors, but does it have to be at the cost of your corporate image? Do you want to do business with a generic company? 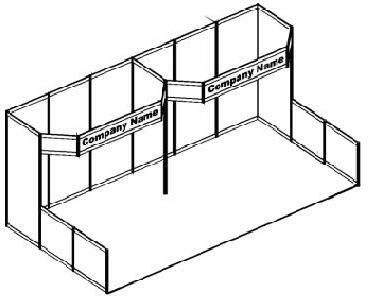 Before joining the trade show industry, I personally was reluctant to do business with companies who had generic booths, if I even considered them at all. You see, I bypassed most generic booths unless I recognized their company name. Do your booth staffers want to work for a generic company? Which company would you rather do business with? Or work for? Another factor (which we often talk about in our seminars) is booth staffers. They are often overlooked when choosing a booth or design and can really make or break a show in my opinion. The look and feel of your booth can influence their pride and confidence. Let me explain. Imagine that your company decided to go with a generic booth for one of your shows. Your staffers are trained and ready to go. As they arrive on the show floor they see their booth with that generic white rental booth and a small header that shows your company name. On their left is a custom booth, to the right is a custom modular booth and in front are several pop ups and banner stands with nice graphics. Competition, with their branded booths filled with nice graphics and logos are represented by a brand, product and capabilities. How do you think your staffers will feel? Will they be at their best? Which booth would you like to work in? Considering your booth is an extension of your office / store front, I personally want customers or potential customers to have a good impression of my company and what we represent. Do you think the energy in your booth will be the same with your staffers if they don’t feel confident or if they don’t have the pride of belonging to your corporation just because they don’t look up to par with your competition? I think those are questions that need to be addressed when planning an exhibit rental. It’s not because you are renting that you need to settle for second best. A colleague of mine had a great analogy about this: If you had to rent a dress or a tuxedo for your wedding, what would you rent? Learn more ways to build your brand at trade shows with the What’s Working In Exhibiting, a 32-page guide to the best overall practices in exhibiting today. Click here to get your free copy. Sebastien Robillard joined Skyline Montreal as an exhibit consultant in 2009 after spending 15 years establishing international business and marketing strategies for companies. He brings experience in the trade show industry through being both an exhibitor and attendee in tradeshows of different industries worldwide. This dual perspective gives him greater insight helping his clients with their Montreal trade show displays. Great point; coming from the construction industry, my perception is companies with generic booths sell generic, commodity products. That’s not always true, but that’s always how they are perceived. Would you rather your booth is the bride – in the custom-tailored dress, hair, makeup, and accessories – or the bridesmaid, wearing something she doesn’t like that someone else chose for her?